Just for the hell of it I decided to make a papercraft template of a zombie based on the "Paper Dude" template. 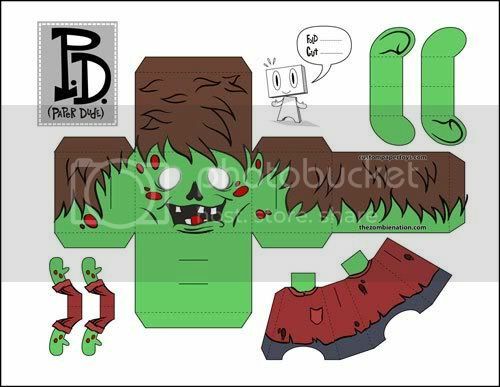 If anyone's interested in recreating the zombie apocalypse in paper form the full size version of my paper zombie is here. I'm going to make a horde of these and post some picts of them soon. Omg those are so cute and funny, If you make a human version we could have our own standoff! hey, you could make these like heroes from TZH! I totally would, but I suspect Jenny would beat me to death for using her characters. This won't be the last zombie I make though. no harm in asking her, right? Neat little project. Might print some greyscale copies out for my nephew and nieces to color and assemble. Tried using the paint-bucket tool in paint to see if some quick color swaps were possible, but apparenly there's an array of shades in there I can't see. HUZZAH! my vote was accepted! That's awesome, if you do I want pictures. Yeah, you should totally ask Jenny to be allowed to make TZH characters as these. I'm not so sure I want pictures of "That"
LOL! Made one last night, its easier to do the cuting bits before any folding etc. In fact, use a craft knife, snippers are useless. Instead of a clean room my girlfriends gonna come home 2 a zombie horde I cant wait!